To navigate this website, simply click on a category you might be interested in. Categories are located on the top, left & bottom of our website. QUICK TIP: Place your mouse cursor over anything you think could be a clickable link. You'll notice that anytime you scroll over something that is a link, your mouse cursor will become a "hand". Whereas scrolling over anything that is NOT a link will leave your cursor as an "arrow". You may also type a keyword into the SEARCH box to quickly find a specific product. 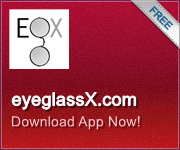 If you have any trouble locating a product, feel free to contact customer service for assistance (info@eyeglassX.com).Don't forget to view our demo video by clicking on the EGX-VIDEOS tab. After adding items to your cart, click the "Checkout" or "View Cart" link at the top of this site to view your cart. On the shopping cart you'll see a box where you may enter your coupon code. Enter code in upper-case with no space, then click apply. If you have any issues, simply click our chat button to message us.